The Indian Premier League has instilled a new life among the domestic and fringe players in India. “Yatra Pratibha Avsara Prapnotihi” meaning “Where talent meets opportunity” is the slogan of the Indian Premier League. The youngsters get a chance to share the dressing room with some of the most experienced players of the game. This helps them to take a giant stride in their career. Manoj Tiwary is one of the biggest names going around in the domestic circuit in India. He has been a consistent performer for Bengal for a long period of time and has become a seasoned campaigner. However, he has represented India in only eight One-day internationals and did not pull up any strong performances. Injuries didn’t help his cause and he is now a long way behind in the national reckoning. The Royal Challengers Bangalore started their home campaign with a win over Kings XI Punjab. 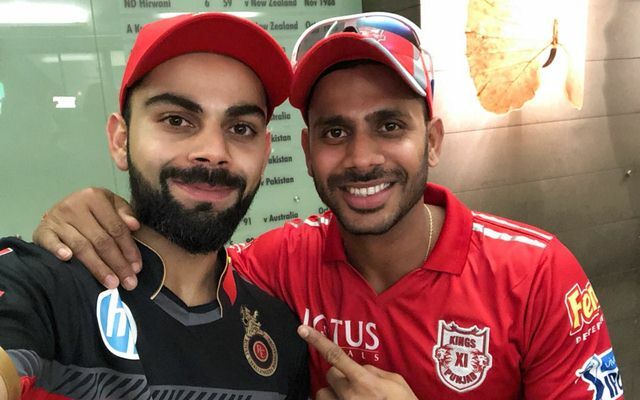 After the game, Manoj Tiwary posted a selfie with the RCB skipper Virat Kohli. He tweeted: Some valuable insights from dis champion last evening, Lots of love @imVkohli May God always b wit u !!! Tiwary, who is currently associated with the Kings XI Punjab hasn’t got a chance to feature in the playing XI yet. In the last edition, he did quite well for the Rising Pune Supergiants having pulled up a couple of strong performances that led the team to the finals. However, we are still in the early days of the tournament and Tiwary will be expecting to get a couple of caps under his belt. The Kings XI Punjab have had a roller-coaster of a start in the current edition of the tournament. While they beat the Delhi Daredevils quite handsomely in the first game, they lost to the Royal Challengers Bangalore after putting up a good bowling performance. Virat Kohli and MS Dhoni in the next song of Dwayne Bravo?